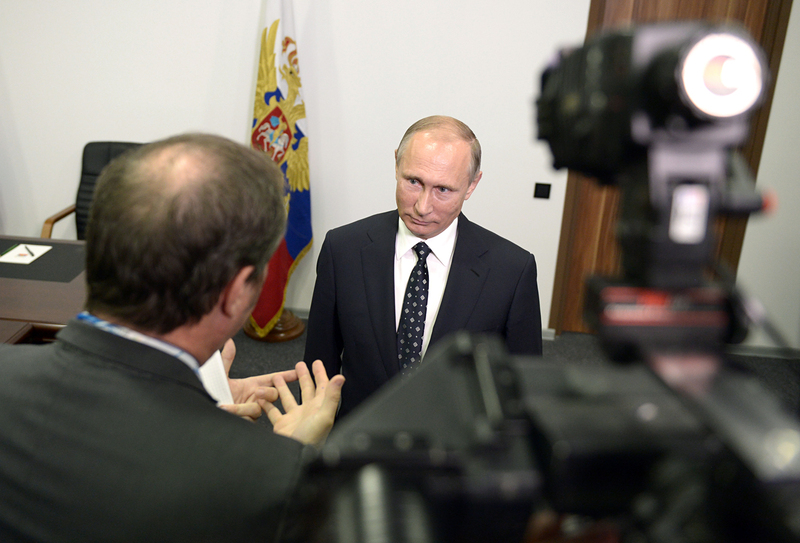 Russia's President Vladimir Putin gives an interview to French TF1 TV channel journalists in the town of Kovrov, Vladimir Region, Russia, on Oct. 11. Russian President Vladimir Putin has canceled a trip to Paris for a planned Oct. 19 meeting with his counterpart, Francois Hollande, who says he is willing to hold talks with Putin on Syria “at any time.” Putin explained in an interview with French channel TF1 on Oct. 11 why he would not be meeting Hollande and also discussed Russia’s policy in Syria. Here are the main points of his responses to journalists’ questions. You know, it's not that we refused, but we were just told that the main reason for my trip to Paris – namely, the opening of this [Russian] cultural and religious center – is now inappropriate. But if the main reason for my trip to Paris is inappropriate, then, perhaps, we will find another opportunity to meet and talk on Syria. We do not have any restrictions in this regard, we are open to dialogue. We were just given to understand that this is not the most convenient time for such events, and that's all. We are not refusing. I would say this is political rhetoric that has little sense and does not take into account the realities that exist in this country, and I will tell you why, right now. I am deeply convinced that, in the situation that prevailed in the region in general and in Syria in particular, the responsibility lies primarily with our Western partners, first and foremost, of course, the United States and its allies, including, of course, the leading European countries. Putin orders suspension of plutonium utilization deal with U.S.
Let us remember how excitedly everybody supported the Arab Spring. Well, where is this optimism now? What did it all end with? Let us remember what Libya or Iraq looked like before these states or their government structures were destroyed by our various Western partners' forces. Now this is the source of the terrorist threat. Our goal is not to allow it on the territory of Syria. Now about the humanitarian component of Aleppo. Have we forgotten how American aircraft attacked a hospital in Afghanistan, where [staffers of] Doctors Without Borders were killed, among others? Entire wedding parties of up 100 people were killed in Afghanistan. And what just happened in Yemen? A single strike killed 170 and injured 500 at a funeral ceremony. In any place where fighting takes place, unfortunately, innocent people suffer and die. But we cannot allow terrorists to hide behind people's backs using them as a human shield, and cannot allow them to blackmail the whole world when they take hostages, kill or behead people. If we want to bring the fight against terrorism to the end, it is necessary to fight them and not follow their lead, bend or move backwards. On the relationship between Jabhat al-Nusra and the U.S. In Aleppo, the situation is controlled by another terrorist organization, Jabhat al-Nusra [rather than ISIS], it has always been considered to be a wing of al-Qaeda and is included in the U.N.'s list of terrorist organizations. What depresses and surprises us is that our partners, including the U.S., are trying all the time, one way or another to take it outside the scope of these terrorist organizations. And I'll tell you why. I think that our partners are constantly repeating the same mistake. They want to use the combat potential of these terrorist organizations and radicals to achieve their political goals, in this case to fight against president [Bashar] al-Assad and his government, not realizing that they will not be able to stall [the militants] and force them to live by civilized rules, if they win a victory against someone. We recently agreed on a ceasefire – the D-Day, as our American friends said. I had insisted that they first solve the problem of the separation of Jabhat al-Nusra and other terrorists from the healthy part of the opposition, and then declare a ceasefire. But the Americans insisted that you first need to declare a ceasefire, and then they would perform the task of separating terrorists from non-terrorists. Finally, we met them halfway, agreed with it, and Sept. 12 was declared a day of silence, the cessation of hostilities. But on Sept. 16, U.S. aircraft launched a strike against the Syrian army, killing 80 people. At the same moment, just after the air strike, ISIS – here it was already ISIS – launched an offensive in this area. Our American colleagues told us that it was a mistaken strike. However, as a result of this mistake, 80 people were killed. This is the first. And the second: Probably it is also by coincidence that ISIS launched an attack immediately after these strikes.